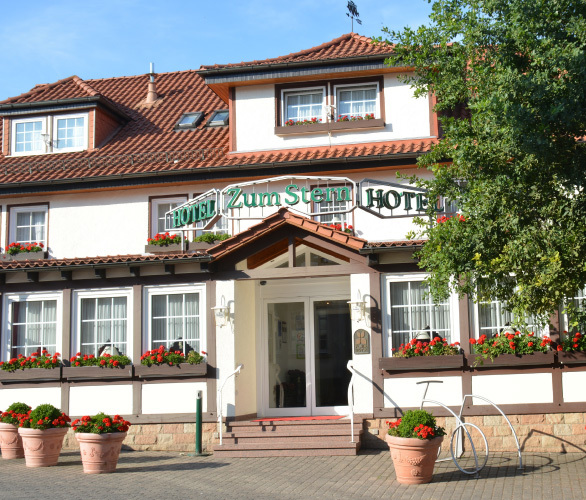 Dear Guest, welcome to our Flair Hotel “zum Stern” in Oberaula, right in the heart of Germany, in Little Red Riding Hood Country at the southern end of the GrimmHeimat Nordhessen – the home region of the Brothers Grimm. Enjoy an active break, luxurious treatment and delicious regional cuisine. Whatever you would like to do – take a short holiday, pursue a leisure activity or just spend a few lazy days, switch off after a hard day’s work, break your journey on the long trip south or north, or if you are planning a productive business conference or a family get-together – we invite you to feel good and relax with us from the moment you arrive. Our aim is to ensure your well-being by taking good care of you and ensuring that your stay with us is a thoroughly pleasant experience. Elke Lepper and the “Hotel zum Stern” staff. No matter which of our buildings you prefer – Main Building, Country House, Guest House or Garden House – all 73 rooms are cosy, comfortable and tastefully furnished in country house style. Good morning! –What better way to start the day after a refreshing night’s sleep than with a hearty breakfast in our restaurant, featuring a wide variety of healthy regional specialities? Let our friendly, attentive restaurant service team pamper you with a wide variety of delicious local and international specialities, freshly prepared for you by our kitchen staff. Whether you have had a strenuous day at work or need to wind down after a top sporting performance, pamper yourself with a Sternstunde Magic Moment in our feel-good oasis. Our location offers you the secluded environment and relaxed atmosphere you need to concentrate on achieving your learning goals. Our six comfortable conference rooms, all with natural daylight, provide the right ambience for seminars, conferences, closed-door meetings and discussions. Modern seminar technology guarantees ideal conditions for the success of your event. Whatever pace you prefer to travel at – trundling across the golf course in an electric golf buggy, striding through the Knüll Hills in a stout pair of walking boots, exploring the Little Red Riding Hood Country cycle path along the course of the old railway line on a bicycle or e-bike, or cruising through the GrimmHeimat Nordhessen on a motorbike, our wonderful landscape of rolling hills and tranquil river valleys is always full of new surprises. Ask us for tips on the most scenic routes.